Welcome to College of San Mateo’s Athletic Program. 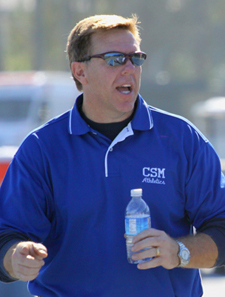 Since 1922, CSM has been providing a solid education for our students both in the classroom and on the playing fields. We are committed to create opportunities for students to learn in an environment that will prepare them for the future. This commitment is evidenced both in our talented and dedicated coaches and our recently renovated, upgraded and newly-constructed athletic facilities. We are proud of the success rate that CSM student-athletes have achieved while participating in intercollegiate athletics. Most of our students complete their requirements to continue their athletic and academic endeavors at four-year institutions. By choosing to study and compete at CSM, students not only discover a place to refine their academic and athletic skills but also become part of our extended "Bulldog family." It is with great pride that we can say CSM is one of the finest community college in the State. We are here to help our students realize their goals and prepare them for their future. College of San Mateo (CSM) intercollegiate athletics faculty and staff are committed to facilitate personal development and academic progress of highly skilled, motivated students, inclusive and respectful of diverse backgrounds through participation in the varsity athletics program. The San Mateo County Community College District, CSM, and the Athletics Department recognize the value of a comprehensive education and are committed to be a model of excellence, showcasing principles of good sportsmanship, including respect towards opponents, officials and the community-at-large, equal opportunity to both genders in the spirit of Title IX, and other fundamental values such as civility, honesty, a strong work ethic, moral character, integrity and social and personal responsibility. The Athletics Department is committed to supporting the academic progress of student-athletes and the achievement of their educational objectives to enable students to realize their true and full potential. While recognizing that the program is a window into the college, the Athletics Department accepts this responsibility and its obligation to uphold the integrity of the institution. College of San Mateo, as a member in good standing with the California Community College Athletic Association, agrees to abide by all the rules of the CCCAA, and the Coast Conference. The athletic program at CSM will embrace the policies, rules and regulations of these member organizations as well as those of the College and the San Mateo County Community College District.